The fun starts when you book Skitbooks for your event. 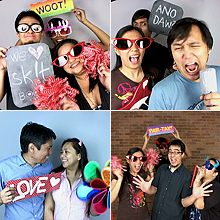 Like your regular photo booth, their well-trained and friendly technicians will set up a booth, complete with a background screen, camera and printing equipment. Your guests will then line up and wait for their turn, whether on their own, as a couple, or as many as can fit in the frame. But that is where the similarity with your regular photo booth ends. Skitbooks uses a video camera that makes a seven-second recording of your guests posing or acting out a skit. They can review the video before giving their okay to have it converted into pictures that are printed, cut and bound. The best thing about it is it only takes two minutes before they experience the fun of flicking through their own flipbooks! Skitbooks can print out as many as 45-50 books in an hour. And at the end of the event, they will give you a DVD copy of all the flipbooks that were printed. How’s that instead of film negatives? Remember being awed with how professional cartoonists draw a sequence of images so precisely on separate sheets of paper that, when stacked and flicked through rapidly enough, seem to be moving? Today, that technology has evolved with the advent of computerized animation. So how about something halfway between the old and new technologies – converting a short video into a series of pictures in a small album that you flick through to watch the images come to life on their own? Say hello to Skitbooks, a Manila flipbook maker and one of the first to bring the technology to the Philippines. Skitbooks, the latest in party booth entertainment, lets you record your own video and “play” it back by flicking through your own flipbook. Enjoy being someone else with the right props and costumes. Be amused with pretending you’re somewhere else by using a green background which the technicians can overlay with an image or video of your choice. Fascinated with jump shots? Still photographs are sometimes caught at the wrong moment and take so many shots to perfect. 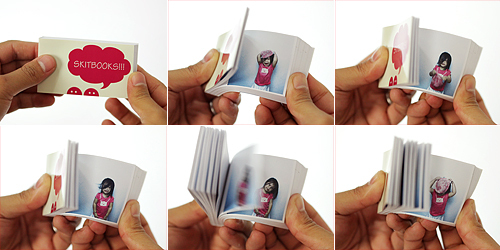 But with Skitbooks, you can flick through the entire flipbook and actually view the entire jump! Do you want something more creative and amusing than the usual postcard to show off your country to your foreigner-friends? Why not send them Manila flipbooks, using the famed Intramuros walls as backdrop? Scenes and actions that you want to appear in your flipbooks are only limited by the imagination. You can even have the option of giving them your own video for conversion. And for a more complete package, change the colors and text of their standard book covers for a more personal touch or to match your event theme. Better yet, make your own for an additional fee. Flipbooks make for interesting invitations and party favors during baptismals, birthdays, weddings, and other events, or even as lasting mementos of that fantastic getaway trip. With Skitbooks, the possibilities for entertainment and creativity are endless.